Young Buckthorn seedlings have a characteristic woody stem and leaf. If you have mature buckthorn, you definitely will have seedlings too! 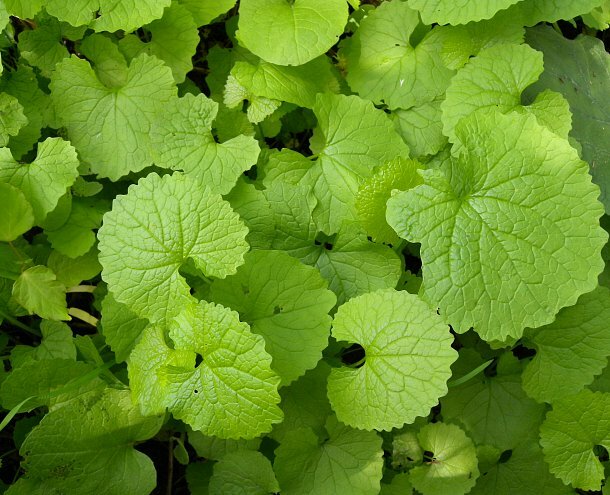 Early leaves of Garlic Mustard look similar to violets but are generally thinner and more lime green. They can completely carpet the ground. 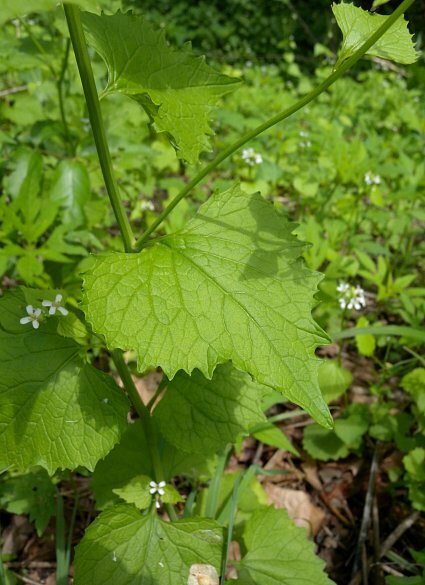 The flowers of Garlic Mustard are quite small and the leaf tips elongate and become more pointed. Mature plants can be 1-4' tall. Spring is a good time to take stock and assess whether your property is home to a couple of troublesome invasive species. One, Common Buckthorn (Rhamnus cathartica), we have talked about before. Although the fall is a better time to control larger stems by cutting and treating, the smaller shoots are really easy to pull when the spring soil is soft and moist. If you don’t get them now they become much more difficult to control! And spring is definitely the time to work on Garlic Mustard (Alliaria petiolata). Huge stands of this plant can develop quickly choking out other vegetation. One vigorous plant can produce more than 7,000 seeds! Introduced from Europe as a potherb, this plant does not support our native insects. Illinois Wildflowers describes this plant as “…the worst invader of deciduous woodlands in Illinois…”. The best control method is pulling the plant. Herbicide sprays will also work but can be difficult to apply if you are trying to avoid any native wildflowers that may be trying to poke through. There have been many a “Garlic Mustard Pull” Stewardship day; get the kids out there helping for a few hours! If you are fortunate enough to have woodland property, please control these invaders! It is a great opportunity to teach the value and benefit of good responsible stewardship.